Wellness advocate and TV/radio program host Cory Quirino will bring her six successful years with Miss World Philippines to fulfill one mission she said she was not able to achieve—to look for that hometown girl—as she formally accepted the position as president and national director of Mutya ng Pilipinas on Wednesday. “I’m in search of that ‘Hometown Girl.’ I intend to give every young girl who dreams of having a crown on her head a chance to be discovered. 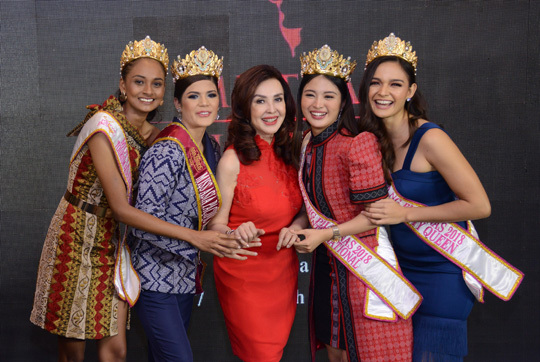 Wherever the Filipina is and whatever hometown she comes from, whether here or abroad, we at Mutya will welcome her to become a member of the Mutya ng Pilipinas family,” Quirino said announcing her vision for the half-century-old pageant. Getting Quirino at the helm of Mutya, now on its 51st year, was a strategic move, “one which will positively secure the future of the organization” revealed Fred Yuson, Chairman of Mutya ng Pilipinas. The idyllic search for that Mutya ‘hometown girl’ as 100 percent organic as its mandate will now pursue its original platform by embarking on a grassroots campaign in alliance with the Liga ng mga Barangay, headed by Kapitana Eden Pineda, under the auspices of Interior and Local Government undersecretary for Barangay Affairs Martin Diño. In a welcome change, Mutya’s new thrust is to discover talented aspirants and give them the chance to become a movie of television star, model or career woman. On this end, a partnership arrangement with A Team president Ogie Alcasid was formed and talks are underway for ABS-CBN to open its doors to Mutya candidates to join the stable of its Star Magic artists. Quirino said that she wanted to strengthen the pageant’s mission and widened its advocacy to give chance to other ladies, especially, in the small towns and barangays, to become a beauty queen. Mutya officially opens this year’s search in April with the coronation night set in August 2019. Winners get the right represent the country in the Miss Asia Pacific International, Miss Tourism International, Miss Global Beauty Queen and Miss Tourism Queen of the Year International pageants.